This quick project is great for last minute gifts at any time of year. 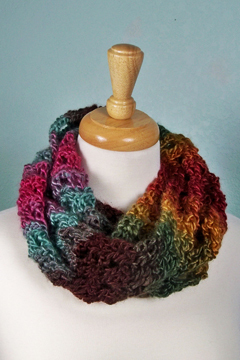 The beautiful colors in the yarn “grab your attention” and give you lots of “bang for your buck”! 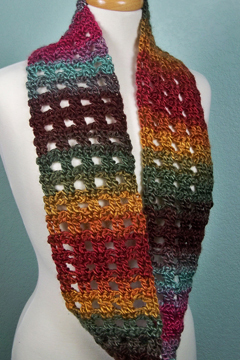 With an easy-to-memorize two row repeat, this project is relaxing and enjoyable to crochet. And the results are spectacular! The pattern includes written instructions, as well as symbol crochet charts. Note: Photographed model made with Lion Brand Landscapes in #204 Desert Spring. Small size uses 1 skein of yarn. Large size uses 2 skeins of yarn.